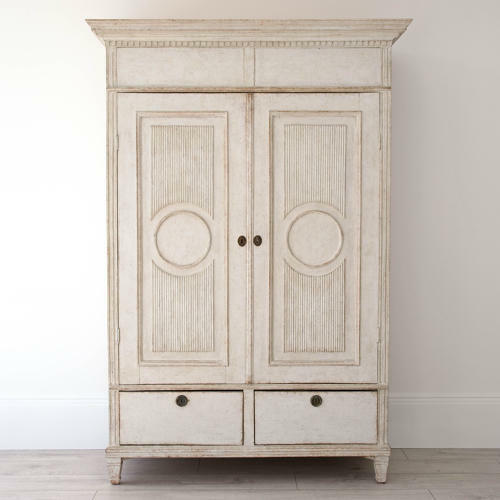 A beautiful Gustavian cabinet featuring; an overhanging pediment cornice with dentil frieze, fluted front corners, inset panelled cupboard doors with vertical reeding & decorative circular details, over two storage drawers, and square tapered feet. Internally the top cabinet is shelved with integral clothes hooks concealed above the cupboard doors. A practical storage piece with wonderful decorative details and of a smaller size that would suit most circumstances where maximum height is an issue. Swedish circa 1840.